The last few years have seen Cadillac rebranding itself in a big way. Their newer cars have been presented as nifty blends of luxury, premium image, and some sportiness. They have gradually gotten more sophisticated as well, with additional interesting engine options as well as chassis tweaked and improved through punishment at places like the Nurburgring. Therefore, if you haven’t been paying attention, this year’s Cadillac ATS isn’t exactly what many might expect from GM’s premium brand. Four-cylinders and turbochargers aren’t usually used in the same sentence as Cadillac, but the ATS tested had exactly that, four cylinders and a turbo. With this car, Cadillac was more or less going for an American BMW 3-Series, and they may have finally pulled it off. Or at least come very close. The 2013 ATS somehow manages to retain the big, imposing stance that one expects from a Cadillac, despite the fact that it is the most compact car in the company’s range. The 109.3 inch wheelbase doesn’t mean that it is exactly small, but it is still a slimmer fit than its larger Caddy stablemates. LED lighting details on the front and illuminating door handles lend technologically advanced style to the ATS, while in between the headlights an interesting grille shutter system lends some technologically advanced function. At high speed, the grille shutters close to reduce drag, thereby enhancing fuel economy. 17 x 8 inch wheels with 225/40-series tires are standard, but our test car had the optional 18 x 8 and 18 x 9 inch wheels in the machined finish. Overall, sedans of this type aren’t really all that distinguishable from each other. The ATS is no different. Just like the German cars it’s competing against, its looks are a tad predictable, but at the same time it’s by no means unattractive, and in the right color, like the “Crystal Red Tintcoat” or “Black Diamond Tricoat”, it can even look pretty sharp. In the sea of BMWs and Audis, it will undoubtedly draw some gazes. With a car like this, though, what’s on the inside can be a bit more important. The modern luxury automobile needs a blend of comfort and technology in addition to performance, and the ATS offers an appealing level of both. LED lighting for the bold gauge cluster makes for a clear, at-a-glance viewing in practically any lighting condition, while ambient lighting further accents functional elements like the console and the doors. Meanwhile, a mixture of wood, metal plating and carbon fiber trim make for a nice place to be, somewhere you might want to stay for a while. 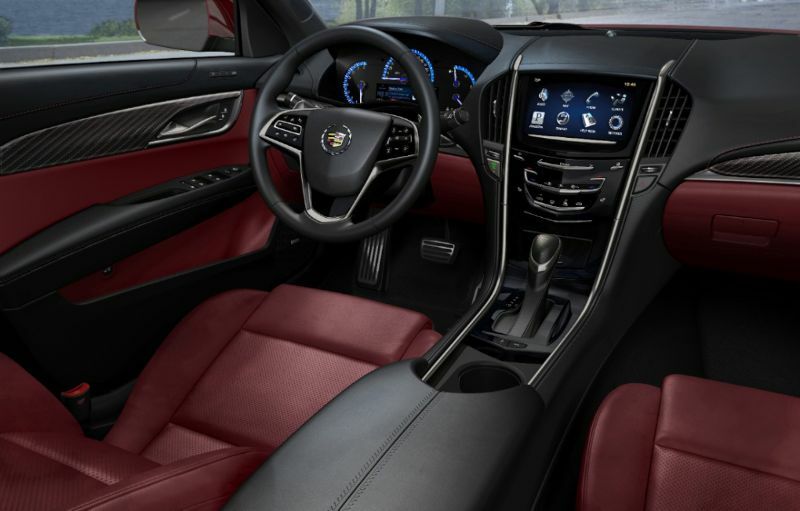 For the now obligatory degree of connectivity, the ATS works with Bluetooth, has auxiliary and SD memory card ports, and features the Cadillac User Experience, or CUE. This pairs personal data from mobile devices with the computers in the car in order to simplify the use of these devices with fewer buttons and fewer steps. CUE works through the 8-inch LCD touch screen in the central instrument panel. Those familiar with a smart phone should be able to navigate the CUE with relative ease. CUE also cleans up the dash by presenting the driver with fewer buttons. For example, many modern luxury cars have around twenty buttons, but CUE reduces that number to four on the ATS. The end result is a pretty slick-looking display that’s intuitive, loaded with features and, importantly, enjoyable to use. Further, a nifty, customizable heads-up driving display is available, allowing drivers to keep their focus on the task at hand. Engine options for the 2013 ATS include a 2.5 liter four-cylinder and the 321 horsepower 3.6 liter V-6, but the most interesting choice (especially for a Cadillac) is the 2.0 liter turbo four-banger. It cranks out a very impressive 272 horsepower and 260 lb/ft of torque, and maybe even more impressive is that this turbocharged, 3,400-pound sedan gets 21 miles per gallon in the city and 31 on the highway. The 2.0 liter turbo on the test car didn’t belt out the greatest of engine notes, but the amount of power coming from such a small motor is a commendable feat of engineering. And it’s quick, making the run to sixty in a shade over six seconds or — to put it into perspective — roughly the same as a Ferrari 365 GTB/4 Daytona. All of the engines are mated to six-speed automatics, but for those of the dying breed that still prefer manual transmissions, a six-speed manual is optional with the 2.0 liter turbo. On the automatics, though, you still get paddles so you can have sportiness or refinement, depending on the mood. Cadillac has been showing us a sporty side for years with cars like the CTS and CTS-V and, now with the ATS, they’ve put it in a smaller package. The ATS offers surprising sophistication in other areas as well. It is somewhat lightweight for a car of its size, and with 50/50 weight distribution, a mechanical limited-slip differential, and multi-link front and rear suspension (double pivot up front and Cadillac’s first five-link rear suspension out back), the ATS is a pleasure to drive around town or on the open roads. Steering is by an electric variable-assist power system, which provides good feedback and feel. It’s obvious the ATS spent many hours in the gym, fine-tuning the suspension and overall chassis dynamics. With the Performance Collection version that was tested, you can feel almost immediately that it is rear-wheel-drive. Lean into the throttle in a turn, and it starts stepping out in the back as a rear-driver should. The ATS is balanced, smooth when smooth is called for and agile when that is on the menu. And when it all has to come to a stop, nice Brembo discs are an available option, and one the car tested was equipped with. They really do haul the car down from speed with ease. Put it all together and the end result is very, very close to the quality feel — and the all-important precision — of a 3-Series BMW. And that is saying something. When shopping for a nice, small, sporty luxury sedan, there used to be few places to turn. The Germans, particularly the BMW 3-Series, have been the obvious choices for what seems like forever. Now, though, it’s not so obvious. 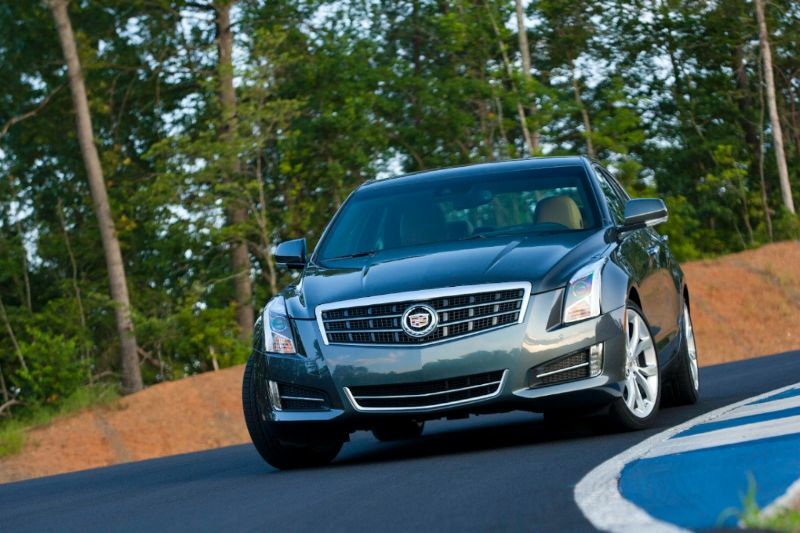 This 2013 Cadillac ATS is a sensible, practical sedan that happens to be a surprisingly good driver as well. While not leaps and bounds better than its German rivals, it is an interesting alternative and, for a lot of folks, maybe even a tempting one. So what’s that got to do with the ATS?